This was originally posted in the September/October 2012 issue or Relevant Magazine. The first time David Sutton roasted his own coffee beans, it was on a BBQ grill. The young pastor loved coffee, and he loved the process of making coffee even more. So when he heard he could roast his own at home, Sutton bought a few pounds of green coffee beans and set to work at the barbecue, roasting the very first of the thousands of batches to come. And to his great surprise, that first cup wasn’t half bad. Sutton has come a long way since those days at the grill. Today he is the owner and founder of the Coffee Registry, a craft coffee roastery and delivery service in Fort Collins, Colo. He is also the roaster, delivery guy, accountant, repairman and janitor. Between being a pastor, a father, a business owner and a roaster, he works weekends and nights and holidays. He sometimes gets to the shop at 5 a.m. on a Saturday after only three hours of sleep to roast beans for the day’s farmers’ markets, which he’ll then spend all day brewing and serving. He has no pension, no health benefits (besides what he gets delivering by bike), no corner office and no promise of a paycheck. And anyone who’s talked with him for more than 30 seconds knows he is a man who loves what he does. Sutton isn’t the only one who’s made an attempt to turn craft into career and been able to find a market for it. In 2010, when Americans were wading through the aftermath of one of the worst recessions in the history of the nation, Colin and Shannon Westcott were opening a business. Colin had long wanted to make a career out of his passion for craft beer and the brewing process, so when the opportunity arose to start his own brewery, the couple was all in—recession or not. The Westcotts opened the doors to Equinox Brewery in Fort Collins that April, hoping the community had been primed enough by the city’s microbrew giants, New Belgium and Odells, to embrace and support one more. By the end of the first month, it was clear to the couple that public support wasn’t going to be a problem—finding a place to put all of it was. Most evenings, it’s hard to find a seat in the brewery even though a draft at Equinox costs between $4 and $8—the better part of what a good chunk of their client base makes in an hour. Artisan entrepreneurs like Sutton and the Westcotts are popping up all over the nation, to the point that this subculture of aspiring artists can no longer be written off as hipsters bent on defying the system. They’re craftsmen and—dare we say—capitalists, creating jobs, boosting local economies and changing the way Americans buy. They’ve pioneered a shift in the economy toward higher quality and lower volume, formulating a new belief along the way that work can be art and art can be profitable. Although this slowly emerging economic trend is influencing artisans across thousands of trades, from letterpressing to carpentry to baking, the craft coffee industry epitomizes the values championed by this new generation of entrepreneurs. Rather than size or speed, craft coffee marketing centers around quality, taste, process, locality and even relationship—traits inherent to what Portland State University professor Charles Heying has dubbed the “artisan economy,” an approach to work that marks a significant departure from the modern industrial system. Although artisan work has always been around, Heying dates this new movement to the 1970s, the beginning of the post-industrial era. However, its overt expansion has only happened within the last 15 years—coinciding with the dramatic globalization, consolidation and de-localization of corporations. 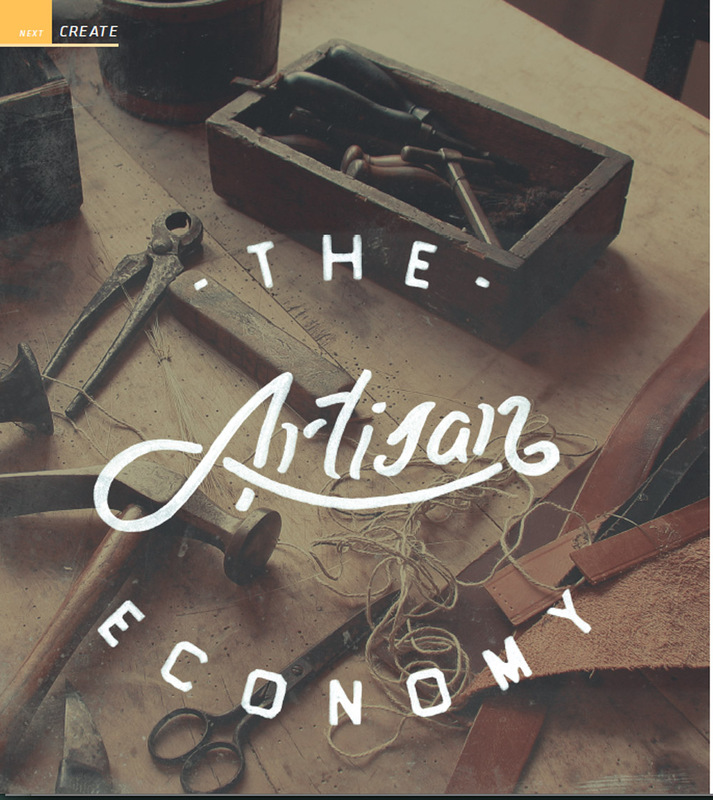 In the new artisan economy, the producer has a significant amount of engagement with his or her product. Design and production are inseparable, and the knowledge and skill of the crafter are necessary and deeply valued by purchasers. The Westcotts rely not only on their product’s taste, for instance, but also on their customers’ appreciation for the process and their willingness to pay more for beer they know more about. Sutton also feels responsible for knowing the story of the farmers who grow the beans he roasts, believing himself to be a steward of their work and ensuring their stories get transferred to customers. Still, Heying makes an effort not to say “consumer” when speaking of the artisan system. In the greater U.S. economy, it’s a term naturally associated with mindless or wasteful devouring of goods, with no thought as to where those goods come from or how they’re made. It’s a term that doesn’t accurately describe the role of the “taker” in this relationship. The crafters themselves are also different from producers in a consumer economy, right down to the hours they work. For Sutton, family comes before work. If his wife or children need him during the day, he’ll fill in where he needs at night or early in the morning or wherever he can fit it in. As his own boss, he knows he’ll get the job done. Whether or not it’s during office hours is irrelevant. Like farmers, Heying says most artisans are connected with the natural world, dependent on seasons and growing periods for what they create. Even those not reliant on the environment tend to work until their projects are complete, rather than circumscribing themselves into the 9-to-5 schedule typical of the industrial economy. The line between life and work can be less stringent because the work is considered life-giving and purposeful, not something to escape as soon as the little hand on the clock hits five. And with craft, a sense of place is paramount. What most know today as the “local” movement is an intimate piece of the growing artisan world, according to Heying. The purchasers and the producers are more anchored to the unique environment in which they live, touting their goods’ terroir—the local landscape, climate and flavor inherent in the products. Whereas Starbucks may boast that their caramel macchiato tastes the same in Tokyo as it does in Topeka, an artisan coffee roaster, like Sutton, would more likely promise that you can’t get their one-of-a-kind roast anywhere else. But unlike other large social movements, like the hippies in the ’70s, this group of artisans creates and consumes craft goods in an effort to redeem business and to be accepted and understood in the mainstream economy. In a column published in the New York Times, economics reporter Adam Davidson calls the craft approach a “happy refinement” of the excesses of the industrial era—not a rejection of the capitalist system. This, coupled with a return to the specialization (in this case, hyper-specialization) that Adam Smith himself could not help but admire, makes for a very new precipice for business. Erwin McManus is best known as the lead pastor of Mosaic Church in L.A. But he also writes, acts, produces films and—among other artistic pursuits—designs a men’s fashion and accessories line. McManus believes to his very core that we, as humans, are undeniably creative—and that such creativity reflects our divine origin. After all, we were made in the image of God, the first Creator. As Christians with direct access to the original Creator, then, there is no reason we shouldn’t be leading the artisan movement, redeeming the workplace and marketplace alike.